A cocktail wonder straight out of your own garden, the Sparkling Borage Cocktail is a delight to sip throughout the summer months. 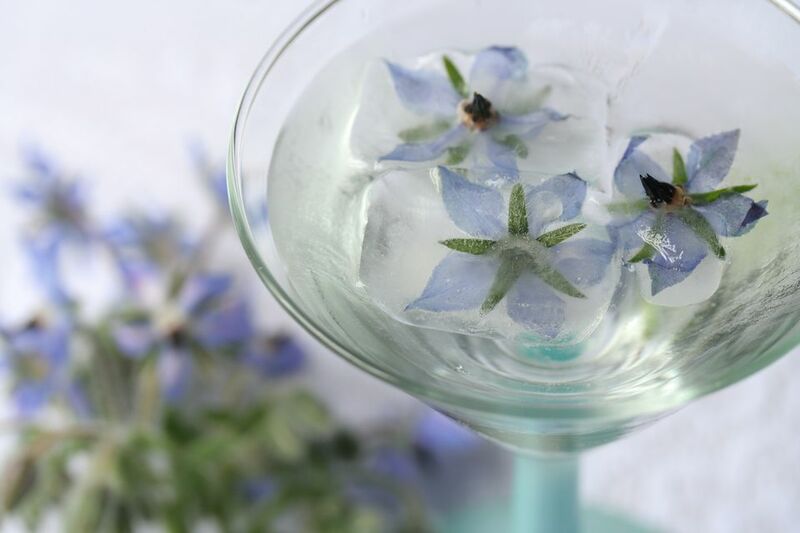 The feature of this gin recipe is the lovely borage herb and its edible flowers, which are frozen into elegant ice cubes. Borage is an annual herb that self-seeds, making it a relatively care-free plant to grow. For gardeners, it's a favorite companion for vegetables as it attracts pollinators and it's fabulous in wildflower gardens. Its stunning star-shaped blue flowers are the star attraction. Both the flowers and young leaves taste like cucumber. In the Sparkling Borage Cocktail, a homemade borage syrup is paired other light herbal flavors, including elderflower and juniper. For the gin, upgrade to one of the new craft gins that have a softer profile like Leopold's American Small Batch Gin or The Botanist. These produce a lovely and delicate cocktail that cannot be created with a traditional London Dry Gin. Pour the gin, St. Germain, borage syrup, and lime juice into a cocktail shaker filled with ice. Add borage flower ice cubes and top with Dry Juniper Berry. Rather than the juniper soda, you can use club soda or a similar lightly flavored soda. However, you will find that the juniper soda adds a refreshing splash of flavor when using a gin that focuses less on juniper. It's still juniper, but a different play on the flavor. Borage is a fabulous cocktail ingredient because of its delicate cucumber-like flavor. It is even the traditional garnish for a Pimm's Cup and has seen a resurgence in recent years. One of the easiest ways to bring it into drinks is through a simple syrup. For the syrup, choose young leaves and flowers. As the plant ages, the leaves become prickly and are not much fun to handle. The syrup itself is as easy as making any other simple syrup, you're simply adding the herb for flavor. Over medium heat, stir until the sugar is completely dissolved and bring to a slow boil. Add 1/2 cup borage leaves and flowers and stir. Remove from heat and allow to steep for at least one hour. Strain the borage from the syrup using a fine mesh strainer. Bottle and refrigerate. It will be good for two weeks or more. Try this syrup in similar lightly flavored cocktails and drinks. It adds a refreshing touch to the Gin Rickey and brings new life to a tall glass of lemonade. Save your best borage flowers for the ice cubes. The flowers begin pink and develop a stunning blue-purple color as they mature. They look fabulous in this otherwise clear cocktail. Making the floral ice is a two-step process because you'll give the flower a frozen foundation to rest on before filling the cube. You will just need to leave yourself enough time -- a little over one day -- to let them freeze completely. Fill ice cube trays halfway with distilled water and freeze. Place a single borage flower on each cube. Fill cubes the rest of the way with water and freeze. This can be done with other edible flowers like pansies as well. Always be sure that your flowers are grown without chemical pesticides and fertilizers and actually safe to be eaten. Growing your own ensures that, though organic edible flowers may be found at some farmer's markets and other outlets. How Strong Is the Sparkling Borage Cocktail? As a martini-like drink, the Sparkling Borage Cocktail is a relatively delicate one when it comes to the alcohol content. On the high side, it will be around 20 percent alcohol by volume (40 proof), though this will vary a bit. It's equivalent to similar drinks like the Key Lime Pie Martini.